Bismarck/Mandan Northern Lights Chorus is a membership organization of singers, who meet regularly to practice, perform, socialize, and have fun. We have singers of all walks of life, and all parts of the Bismarck/Mandan area. The main purpose of Bismarck/Mandan Northern Lights Chorus is to get out and sing for our community. We sing at annual shows, a number of community events, and at annual competitions. We also perform Singing Telegrams around Valentines Day . We are available to sing at your next function or event. If you're looking for a unique musical experience to liven up your event, please check out our Hire Us section. Competition In the spring of every year, Bismarck/Mandan Northern Lights Chorus participates in regional chorus competition. These competitions are a special time for quartets and choruses from our region to come together to sing for each other, and get some constructive feedback from a panel of judges. The winners of the regional competition in both quartet and chorus categories get to travel to International Competition, which is held in the fall in a city selected each year. In 2019, International Competition will be held in Salt Lake City, UT. Click here to learn more. Most choruses have a number of members who form their own vocal quartets in addition to singing with the chorus. Bismarck/Mandan Northern Lights Chorus currently is home to a number of wonderful quartets, and we are very proud of them! Click here to see our quartet section to learn more about them. 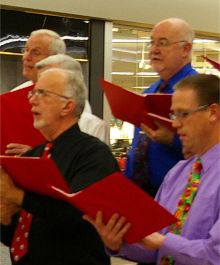 Bismarck/Mandan Northern Lights Chorus is a chapter of Barbershop Harmony Society, a non-profit organization of approximately 25,000 members in choruses and quartets, worldwide. The Headquarters is in Nashville, TN.